There are plenty of advantages to using a Linux laptop. In fact, more and more people switch to laptops running on Linux-based operating systems every year. Besides the obvious benefit of being free, Linux operating systems also tend to have better security and are less likely to fall prey to viruses and malware. It is also generally more stable than other operating systems. There is also the added benefit of having an operating system that is customizable to an individual’s own specifications. One of the biggest complaints when making the switch to a Linux laptop is that it can sometimes be hard to figure out whether the laptop is compatible with Linux, especially with new hardware and their drivers. Unfortunately, not all manufacturers come out with Linux-compatible drivers all the time. We have done the research for you. After much researching, we have chosen our Top Five Picks for Best Linux Laptop. Note that most of our Top Five laptops do not come with a Linux operating system pre-installed; however, part of the joy of owning a Linux laptop begins with the installation and experiencing the freedom of controlling and changing it to your exact specifications. Our #1 pick for the best Linux laptop is the Lenovo ThinkPad X1 Carbon . Lenovo is a manufacturer that has proved to be committed to providing compatibility for Linux users. Their range of ThinkPad series laptops are one of the most popular models amongst Linux users. The Lenovo X1 Carbon is the manufacturer’s latest laptop and is a hit amongst Linux users. The X1 does a fantastic job of combining compatibility, excellent hardware, and amazing elegant design. As the name suggests, the X1 Carbon comes with chassis made from satellite-grade carbon fibre. The carbon fibre casing makes the X1 a tough and durable laptop that can stand to be moved around quite a bit. It also has a fingerprint reader for extra security when on the move. The X1 Carbon laptop is classed as an Ultrabook, weighing in at just 2.6 pounds and a mere 16.5 mm in thickness. Lenovo claims that it is the lightest 14” business Ultrabook on the planet. The laptop also has a great battery life, lasting up to 11 hours. The 14” screen features Full HD and anti-glare with a resolution of 1920 x 1080. The X1 Carbon runs on a 2.3 GHz 6th-generation Intel Core i5 and 8 GB DDR3 SDRAM. It comes with 256 GB solid state drive (SSD) storage. You can be sure programs will be loading fast and running smooth with this combination. The X1 comes with the expected 802.11 ac wifi and Bluetooth 4.0. It also has two USB 3.0 ports as well as a HDMI port and Ethernet connection port. It includes Dolby audio integrated speakers and a high-definition webcam. Dell is another manufacturer that has put a strong emphasis on building laptops with Linux compatibility. Dell’s XPS 15 is also a laptop that is frequently chosen and raved about by Linux users. The XPS 15 is powered by a quad-core 3.5 GHz Intel Skylake Core i7-6700HQ and 8 GB DDR4 RAM. For storage, the XPS houses a 256 GB PCIe solid state drive (SSD). Operating systems and programs load in a flash with this laptop. In addition to great processor, memory, and hard drive, the XPS 15 also comes with an NVIDIA GeForce GTX 960M graphics card with 2 GB dedicated GDDR5 RAM. With a 15.6” Full HD screen with 1920 x 1080 resolution, eye strain is certainly mitigated on the XPS 15. The XPS 15 weighs in at 3.9 pounds and is reported to have a battery life of up to 10 hours. Its thickness measures in at just 11-17 mm. Dell’s XPS 15 also includes an SD card slot, a USB 3.0 port, and a HDMI port. It also has a widescreen HD 720p webcam with dual array digital microphones. The ASUS ZenBook UX305UA is another laptop that is classified as an Ultrabook, meaning you are guaranteed to get a laptop that is thin and light. The ZenBook weighs just 2.9 pounds but still manages to bring up to 10 hours of battery life. The ZenBook UX305UA features a 13.3” Full HD LED-lit screen with a resolution of 1920 x 1080. The screen is also anti-glare matt display. Its all-aluminum body gives the laptop a sleek and elegant look. This ASUS ZenBook is powered by a 2.3 GHz 6th-generation Intel Core i5 and 8 GB DDR3 RAM. It also has 256 GB solid state drive (SSD) hard drive for that speedy load. The ZenBook comes with the usual 802.11 ac wifi and Bluetooth 4.0 support. In addition to that, it also includes two USB 3.0 ports, a USB 2.0 port, a micro HDMI port, and an audio jack. The Dell Inspiron 15 features a 15.6” High Definition LED screen with a resolution of 1366 x 768. Its screen is a touchscreen with 10-finger multi-touch support. On the inside, the Inspiron 15 houses a 1.8 GHz AMD A10-8700P processor along with 8 GB DDR3L RAM. In addition to that, Dell’s Inspiron 15 also comes with an AMD Radeon R6 graphics card with shared graphics memory and a 1 TB 5400 RPM hard drive. A 4-cell lithium ion battery offers a battery life of up to 6 hours and the Dell Inspiron 15 weighs 5.34 pounds. Dell’s Inspiron 15 comes with a DVD +/- RW drive and an SD card reader. It has 802.11 b/g/n wifi and Bluetooth 4.0, a USB 3.0 port, two USB 2.0 ports, a HDMI port, and jacks for headphones and microphones. The Inspiron also comes with an integrated webcam. Altogether, the Dell Inspiron 15 does a great job of offering affordability while providing performance and connectivity. You can’t talk about Linux laptops without talking about Chromebooks. Chromebooks run on the Google Chrome operating system and has been rising in popularity in the past few years. If looking for an affordable laptop that comes with a Linux-based operating software pre-installed, a Chromebook might be what you are looking for. And Acer’s Chromebook 15 is certainly a Chromebook worth taking a deeper look at. The Chromebook 15 features a 15.6” Full HD widescreen LED-backlit display with a resolution of 1920 x 1080. In fact, Acer claims this is the world’s first 15.6” Full HD Chromebook. Its 4-cell lithium ion battery provides a battery life of up to 9 hours and the Chromebook weighs just 4.85 pounds. Acer’s Chromebook 15 is powered by a 1.5 GHz Intel Celeron Dual-Core 3205U Processor based on Broadwell micro-architecture. It runs on 4 GB DDR3L SDRAM memory and comes with 32 GB solid state drive (SSD). The Acer Chromebook 15 can boot up in as fast as 7 seconds. The Chromebook 15 comes with 802.11 ac wifi and Bluetooth 4.0. It has dual stereo speakers, an SD card reader, a USB 3.0 port, a USB 2.0 port, and a HDMI port with HDCP support. Linux is such a flexible operating system that we really had our job cut out for us when selecting the top five best features for a Linux laptop. This is an operating system that people install on old computers to serve as file servers or on brand new laptops to serve as their primary device. It is used by IT professionals who are looking for more stability to teenagers who just want to play around with customization. Linux is an extremely stable operating system that does not require much processing power or memory to function well. As such, our considerations turned towards the more physical features of a Linux-compatible laptop. From our research, battery life ended up being the most important consideration for a Linux laptop. We found that many of the people who use Linux laptops are also people who are looking for a good laptop that can last a long time. A laptop battery’s lasting power always decreases with time and usage. This is why many laptops seem to last just a couple of hours unplugged after a few years. Batteries tend to be one of the first hardware parts to need replacing on a laptop. Linux users are generally quite loyal to their laptops and therefore look for laptops that have batteries that are as likely to last. Most Linux users are very comfortable with technology and tend to spend hours staring at a screen. We found that display size was an important factor when choosing the best laptop for Linux. Small screens tend to strain the eyes more as details are squeezed into a smaller area. Larger screens certainly help a lot in reducing fatigue in the eyes. The best Linux laptop we chose should be within the 13” to 15” range in order to maximize screen size without becoming too heavy for mobility. Many Linux laptop users either already have a main desktop at home or lead mobile lives. Whether looking for a mobile secondary laptop or a portable primary laptop, weight factored in as a significant consideration for many when choosing a Linux laptop. The best Linux laptop needs to be light-weight and portable for easy movement and mobility without compromising too much on display size or battery life. One of the benefits of using a Linux-based operating system is that it does not require as much processing power as Windows or Mac operating systems. That said, it does not mean that Linux users purposely aim to own computers with low processing power. In fact, we found the case to be quite the opposite. Linux users are generally technologically savvy and are up-to-date on the latest processors in the market. They are people who understand what makes a laptop run well. They know how to appreciate a smooth-running laptop. While a great processor may not be important in owning a functional Linux laptop, Linux laptops should be more than merely functional. Similar with the processor, Linux users know that a laptop’s memory should keep in step with its processor. With today’s line of processors and hard drives, the best Linux laptops should have sufficient memory to run programs and software smoothly and efficiently. A Linux laptop should have a minimum of 4 GB RAM, ideally reaching up to 8 GB RAM or more. Laptops can be troublesome when trying to figure out its hardware driver compatibility with Linux. However, once that is figured out, we found that there is such a wide variety of compatible laptops to choose from. Our #1 Pick – the Lenovo ThinkPad X1 Carbon – got its spot thanks to its ability to offer a great light-weight laptop with fantastic battery life while still providing top-shelf performance hardware. Our #2 Pick, the Dell XPS 15, came in close on the Lenovo X1’s tails, giving a truly excellent combination of hardware including an NVIDIA graphics card, but just fell shy when it came to weight and battery life. The ASUS ZenBook also managed to bring a great combination of specs to the table in a light-weight laptop. It fell a bit short on the screen size of just 13.3”, but that does not detract much from its great processor, memory, and hard drive. 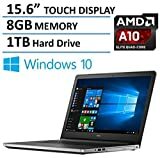 The Dell Inspiron 15 5000 is a great pick for those looking for an affordable laptop that comes with good processing power as well as connectivity and a DVD drive. Finally, the Acer Chromebook is a great choice for anyone looking for a cheap and mobile laptop to carry around for work that does not require an extremely powerful laptop. We look at five of the best Linux laptops on the market. Whether you're an IT professional or just looking for a change of OS, Linux is a solid choice.